There must be an overlap of the stages in order to assure good pollination. On a single tree panicles emerge and develop at different times. This insures that there will be pollen available to fertilize female flowers and obtain good fruit set assuming that there is a pollinator like bees to carry the ripe pollen from the male to the female flowers. Having multiple trees, such as in a grove situation, or having a tree of a different cultivar with different stages of panicle development assures that there will be improved overlap of pollen bearing male flowers with receptive female flowers. Figure 5: Bee Taking Nectar from the Calyx Gland of a Lychee Female Flower. To a small degree you can get some minimal wind pollination, but insects such as bees, wasps, beetles and flies do most of the work. In particular, honeybees, are the primary carriers of pollen and for good fruit set care should be taken to maintain bee hives around a grove. The bees are attracted to the nectar which is secreted in the morning by a gland within the base (calyx) of the flower to which the stamen and pistils are attached. Bee Hives in a Typical Grove - Note the Removal of Most Vegetation Away from the Area Around the Hives. You should consult the services of a professional bee keeper (apiarist) if you plan to maintain bees in your grove. Keeping bees is a science in and of itself. There are many insect predators that affect bees, such as hive beetle and wax worm and for effective grove management you need an apiary professional. The honey that is derived from the nectar of lychee flowers is a very superior variety. Unlike citrus based honeys lychee honey does not crystalize. The color is darker than orange blossom honey and the flavor is very pleasant. Lychees can be artificially pollinated. 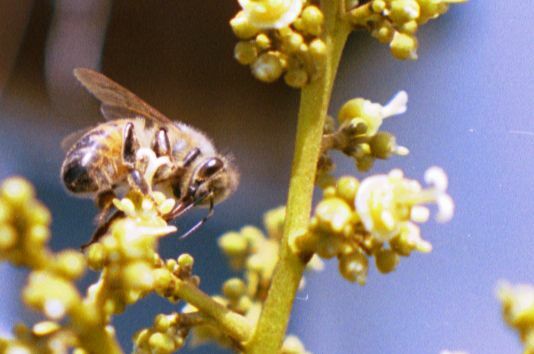 The ripe pollen must be collected by lightly tapping male flowers onto a towel and washed into a solution which can then be immediately prayed on the receptive female flower clusters. >Go to the next chapter: "Part 6: Flower Pests"